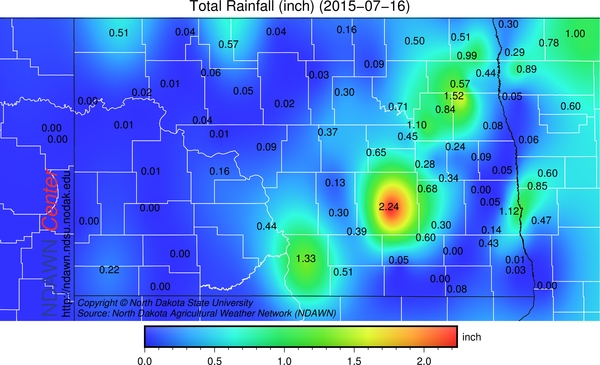 Rainfall totals across the North Dakota Agricultural Weather Network (NDAWN) yesterday included many locations with little if any rainfall, then some localized areas of heavy downpours with 1 inch or more recorded. There will once again be shower and thunderstorm activity in the region today. 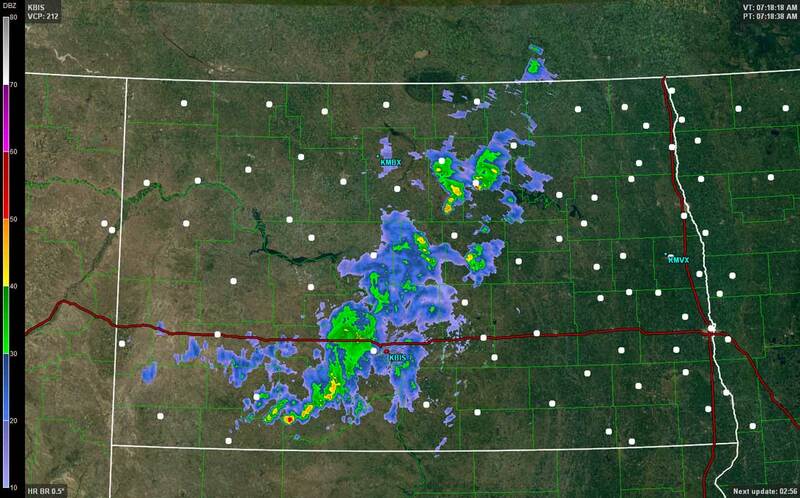 There is already a band of generally lighter rain, mixed with a few embedded thunderstorms across central North Dakota that will be moving easterly during the day. The High Resolution Rapid Refresh (HRRR) computer guidance takes this activity to the east with some redevelopment during the day. Because of the speed of this disturbance in combination with lesser amounts of atmospheric moisture (subtle), amounts today overall look to be lighter, again, I always emphasize, there is always “the spot”, but amounts in theory do look lighter in those “spots” today. The precipitation is expected to last into tonight in some areas, but should be gone quickly tomorrow meaning the weekend looks dry and cooler, especially Saturday. The temperatures projected above may be a bit cooler than what the actual maximum will be in many locations, but it does appear most NDAWN stations will record a high in the 70s on Saturday. 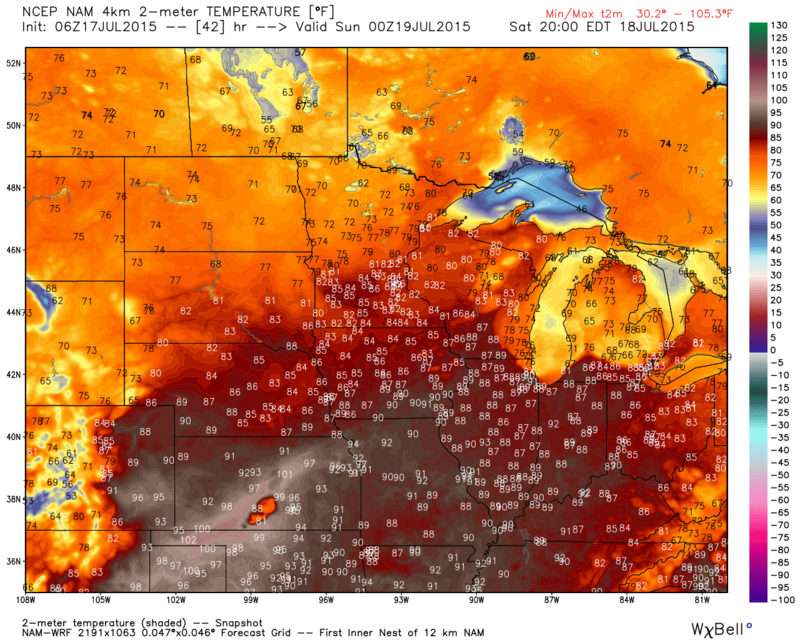 A bit warmer on Sunday, especially western North Dakota should get well into the 80s. All locations in the 80s on Monday (some near 90), then trending cooler again next Tuesday, with this bounce between above and below average temperature occurring there after. Meaning, consistent heat and humidity that the area has experienced over the past 10 days will be replaced by a more variable day to day temperature pattern. Besides the rainfall that is expected in the region today, the next better threat of rain will come in the middle of next week (Tuesday/Wednesday time frame). Beyond the next week there are conflicting atmospheric signals as to what will occur over our region, my gut (experience) leads me to believe we will get into another period of above average temperatures and higher dew points to finish out the month. My original thinking for this summer was a slightly above average June, slightly below July, slightly above August for a near to slightly above overall summer temperature (1° positive anomaly overall). But looking ahead, it appears July will end up finishing slightly above average which increases the odds that overall this summer (June 1 through August 31) will finish with a positive temperature anomaly in North Dakota and northwestern Minnesota as I still feel August will have overall an above average temperature pattern. Precipitation variability also is expected to continue for the second half of the summer.